LawnTec tires are a chevron design tire with a very flexible 2 ply nylon sidewall with a heavy weight 4 ply tread face. This gives the tire excellent tread shape retention and allows the tire to react smoothly on the track with its soft side walls, it also helps eliminate bouncing (torque hop) of the rear tore during heavy loading. 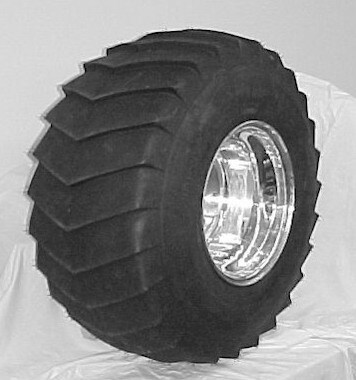 The tires have 27 lugs to give it a fuller bite with each lug.Tires with too many lugs tend to sit on top of the ground and not dig in when track conditions become harder. 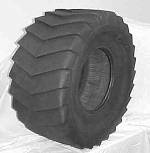 This tire is a result of over two years of research, development and testing to come up with a tire that works best for single and twin cylinder garden tractors. The goal was trying to match lug spacing with the expected tire speed of the application for the best overall performance on most track conditions. LawnTec Yard & Turf 26" x 12" x 12"
Mounted on Douglas 12" Polished Aluminum Wheel.